Fine throughout with light /moderate variable winds and small swells, except afternoon Day 3 when c3m swells, and all of Day 4 when no wind and flat seas (and virtually no birds!). Tank Barker (skipper of Demelza), Tim Barnard, Derek Bettesworth, Thomas Paul, Ian Smith, Steve Wood, Brent Stephenson and Sav Saville (Wrybill Birding Tours – organisers). The whole trip was effectively one great big highlight! The first few hours of Day 1 and most of Day 4 had few significant birds, but lots of flesh-footed and Buller’s shearwaters, fairy prions, black petrels andcommon diving-petrels. 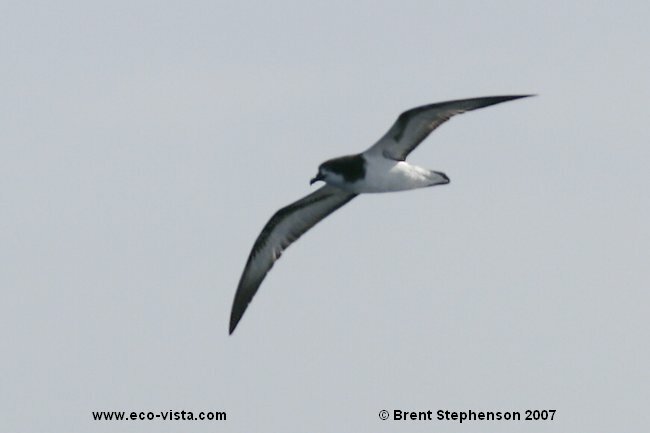 The first WHITE-NAPED PETREL appeared after about 5 hours at sea, and was followed by a staggering 26 ( yep – 26!) more during the rest of the trip. The first of 20 WILSON’S STORM-PETRELS was the next decent bird, and a slight disappointment was the fact that only Wilson’s and white-faced stormies were seen, so no NZSPs nor the much hoped-for White-bellied. Morepterodromas pitched up after midday on Day1, with many black-winged, a few Cook’s petrels and the first KERMADEC PETREL (an intermediate phase bird). Steve Wood had brief views of a pale cookilaria petrel with a dark head which may have been a Stejneger’s and then we all saw a chunky, darker pterodroma with a blackish head and reasonably strong black underwing bars which we thought was probably aGOULD’S PETREL. Day 1 ended at the Three Kings, feeding on Striped Marlin and listening to scores of grey-faced and black-winged petrels overhead in the dark. Day 2 dawned misty but soon cleared, allowing great views of swags of grey-faced petrels, big rafts of Buller’s shearwaters and then quite clearly a(nother) GOULD’S PETREL – this time allowing more prolonged looks and dispelling any doubts about the identity of the previous day’s bird. 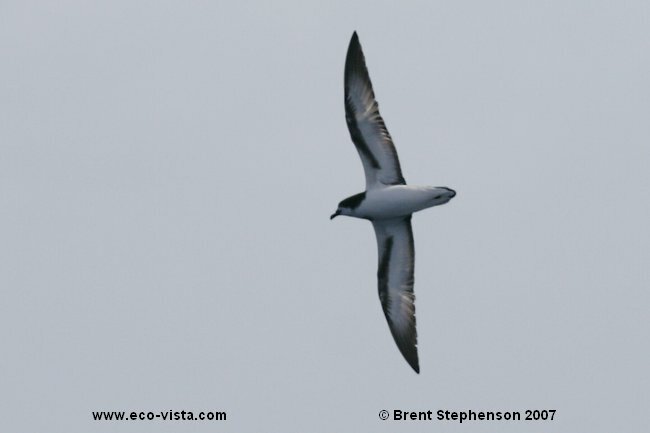 This was followed by another 6 KERMADEC PETRELS (we eventually tallied 18 Kermadecs for the trip!! ), a few grey ternlets, a pomarine skua with fully developed “spoons”, and then, a personal highlight, a white dot in the distance which we were able to chase down and confirm as a WHITE TERN. It looked as if Day 3 would have to be truly spectacular to improve on the previous 2, and so it duly was! A sub-adult LONG-TAILED SKUA sitting on the water was a good appetizer for our first chumming stop which brought in a photographable GOULD’S PETREL, at least 6 differentKERMADEC PETRELS, Wilson’s storm-petrel, grey ternlet and a brown skua. All the while there was a myriad of pretty much all the previously mentioned species, and then we topped it all off with a RED-TAILED TROPICBIRD and a fourth GOULD’S PETREL. Day 4 was a massive anticlimax – with flat calm seas, no wind at all and very few birds of note – a couple more Wilson’s stormies and a brown skuabeing the best. Wandering Albatross – 9 (2), including a couple of very young birds. Most appeared to be likely Gibson’s with one apparent Antipodean on Day3. White Tern – 1 (1). We will be running the same trip next year at almost the same time – if you are interested in coming please let me know. Most of this year’s participants will be going next year – so book early!!!!! There is only room for 7 birders……..